There are two parts, Part A and Part B. Part A is textbook based. Students complete 5 units that have been designed by ICL. Part B is topic based. Students complete 5 NZQA unit standards. New Zealand Certificate in English Language (Academic) (Level 5) [Ref: 1884]. – many vocational and undergraduate programmes and specialised fields of study requiring lower and/or New Zealand Qualifications Framework Level 5, for entrance, depending on the focus of the programme leading to this qualification. Produce evidence of proficiency in English equivalent to a Common European Framework of Reference (CEFR) B1 Intermediate level. This may be demonstrated via a recognised English language testing system such as IELTS, Cambridge, TOEFL, achievement in the New Zealand Certificate of English Language (Level 3), or achieve an appropriate score on ICL’s placement test. 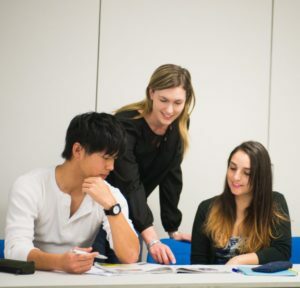 Where a prospective student for the NZCEL (Level 4) programme cannot produce evidence of current English proficiency, ICL will use their own placement test to assess and determine the student’s entry level.